The Arai VX Pro4 dirt helmet is for the serious off-road enthusiast, who requires nothing but the utmost in comfort and protection from their lid. The round shell shape is based on Arais R75 Shape Concept and is optimized for strength and the peak, mouth vent and top vents are all designed to break away upon impact leaving less surface mass to catch or bind. The interior Dry-Cool liner and cheek pads have been redesigned for comfort and ease of putting the helmet on and removing it, and feature Arais signature triple-density foam construction. 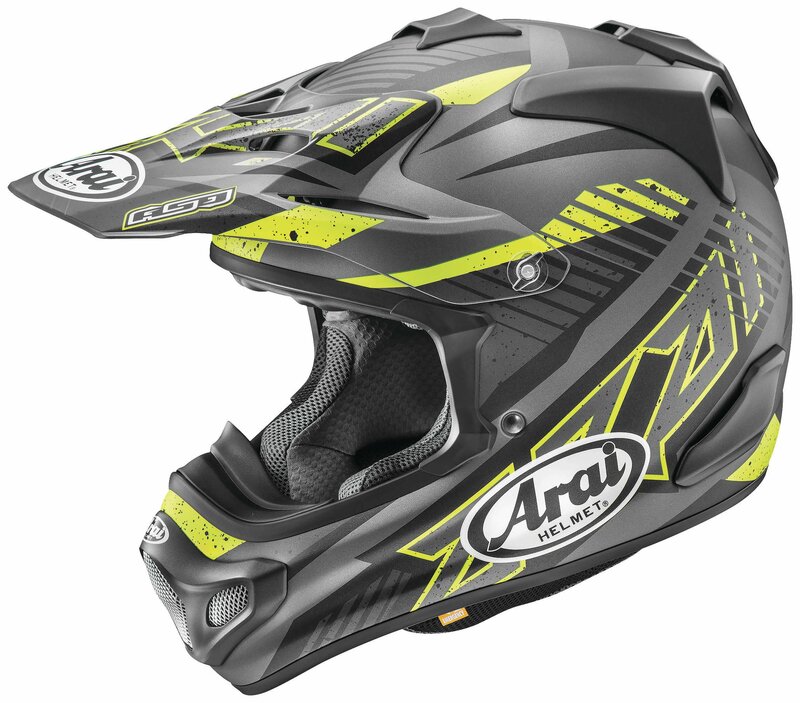 The Arai VX Pro4 dirt helmet is for the serious off-road enthusiast, who requires nothing but the utmost in comfort and protection from their lid. The round shell shape is based on Arais R75 Shape Concept and is optimized for strength and the peak, mouth vent and top vents are all designed to become independent from upon affect leaving less surface mass to catch or bind.. The interior Dry-Cool liner and cheek pads have been redesigned for comfort and ease of putting the helmet on and removing it, and feature Arais signature triple-density foam construction. The eyeport is extremely wide and is large enough to accommodate even the largest goggles for a panoramic view of your surroundings. All of the VX Pro vents have been redesigned, including an all new chin vent which has been moved to the out of doors of the helmet, which in turn makes the helmet roomier in the chin area. The other vents have been re-tooled as well, to provide increased airflow..
cLc (complex Laminate construction) contains a specially designed composite fiber that may be sandwiched between the two layers of Super Fiber Laminate. The composite fiber acts as a reinforcement layer without adding significantly to the weight of the helmet..
To offer an even better snug fit and give a boost to the comfort to the lower jaw, the Facial Contour System (FCS) works with a foam spring strengthen in the cheek pad that compresses and rebounds as you remove or put on the helmet..
Easy to clean diffusers create a strong venturi vacuum at the rear. Center top vent for increased airflow. Under-peak air intake collects en directs cool air into the helmet. Inner chin vent shutter prevents debris coming into the helmet in dusty riding conditions. Goggle ventilation and lower side vents.. The round shell shape is based on Arais R75 Shape Concept and is optimized for strength and the peak, mouth vent and top vents are all designed to become independent from upon affect leaving less surface mass to catch or bind. The eyeport is extremely wide and is large enough to accommodate even the largest goggles for a panoramic view of your surroundings.